Cool Cab, the hottest ride in Whatcom County! Providing on the ground transportation from Bellingham (and surrounding areas) to where ever you want to go! 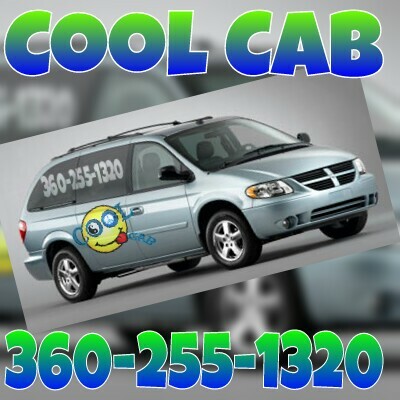 Cool Cab is a locally owned, independent taxi service based in Bellingham, WA. We operate in association with several locally owned taxi services and independent drivers in order to provide our customers with round the clock, on-demand transportation. We are available 24 Hours a day, seven days a week! Licensed, Insured & Registered Taxi Vehicles are well maintained, comfortable and clean. Our taxis can accommodate at least 4 passengers and luggage without compromising safety or elbow room. Our Drivers are professionally licensed taxi drivers with proven safe and honest track records driving commercially. Each driver has been background checked and finger printed by Bellingham Police Department. You can rest at ease knowing you are safe riding with our friendly, knowledgeable cabbies. Johnie Pai is the Owner of Cool Cab and drives four days (and/or nights) a week. Stacy Price is the Business Manager. She handles paperwork and all the other boring stuff. When you call Cool Cab either Johnie or Stacy will be happy to assist in any way they can. They will answer any questions you may have and when you are ready to book a ride they will gather your information, arrange for a taxi to pick you up asap or schedule your ride for the near future. Johnie has been a taxi driver for four years. He started driving for Designated Taxi and found that he loved interacting with so many different people from different areas and backgrounds. He likes helping people find their way and goes above and beyond whenever can to leave his passengers with a smile. Prior to driving a taxi, Johnie drove professionally for many years in a few different industries. Most recently he drove as a lumber delivery driver for Pacific Building Center and as a concrete pump driver for Western Concrete Pumping. He loves driving and is very good at it, he is aware, alert and prides himself on keeping his vehicle and passengers safe. Johnie is a lifelong resident of Whatcom County, born at St,. Joseph's hospital and a graduate of Blaine High School. He is proud to be from this area and knows it's roads and highways very well. He also knows the various businesses in the area and can make recommendations for where to eat, shop and explore.